The past month in the Middle East has seen a flurry of conflicts that is unprecedented even for that region. In Syria, dozens of civilians are being extinguished daily by a tyrannical regime. Israel has re-engaged its tactical killing of Palestinians and thus another Gaza conflict seems under way. In Egypt, the Musri administration is getting ready to confront a slew of issues that will be critical for the development of the country. In order to understand these issues, one needs a deeper knowledge of the root causes and influences that have created the current situation. Taking a look at Syrian history, one can’t help but see the boundless parallels between the current situation in Syria now and Syria under French occupation. In both cases, the regimes in power did not represent the greater will of the people, they killed indiscriminately, and they destroyed large swaths of ruins, and Syrian heritage, and neighborhoods. The primary difference between the French occupation and the current Syrian regime is that the latter are born in Syria. This current regime represents a minority of the population and was shielded, and brought into power with the assistance of Western superpowers like France, Britain and Russia. To ensure their place in power and their continued wealth, the ruling Alawites raped, pillaged and drained the country of its assets and any hope of progress. The tactics and ethos of this regime are straight from the French playbook. While it is ironic that France is the first Western power to back the Syrian opposition, the last of the colonial enslavement shackles it instituted is still being removed one hundred years later. Politics in Israel is a contentious topic for all involved parties. For years, the political moderates have been ignored in favor of hard-lining radicals. The current situation is no different. Mr. Netanyahu, a hawk and leading voice of Zionist expansion, needs to re-affirm his position. What better way to do so before an election than to bomb Gaza and threaten Iran. This agrees with his tough-man image and gives him more credence. This calculated war will no doubt propel him to another election victory. The problem with this thinking is needless killing of both Palestinians and Israelis. This political divide has created is a deeper divide among the people in the region as well as more pent-up hatred and violence for future generations. Egypt has been the gold standard in terms of successfully and peacefully overthrowing a tyrannical regime. The problem is after this overthrow, it has been very hard to change the internal structures left in the aftermath. The army and the Muslim Brotherhood have dominated the new landscape. Enforcing and creating the legislation to ensure their continued power and success. The dramatic change needed and wanted by the people seems to be largely ignored. For years, the Egyptian economy has operated around the necessity for international subsidies and tourism. This current regime has yet to think out of the box on creating new jobs and new sectors in the economy. What has resulted, is an overarching need for change with no tangible way to address it in the current government. Egypt, can not be an effective power in the Middle East and a model for other countries to follow, under present conditions. It needs to have real meaningful political and social change in order to be a leading power again. Unfortunately there are no easy solutions present in the Middle East. The wars in Syria and Israel will leave the Levant in a terrible state of recovery. Egypt has a long way ahead before its true future will unfold. 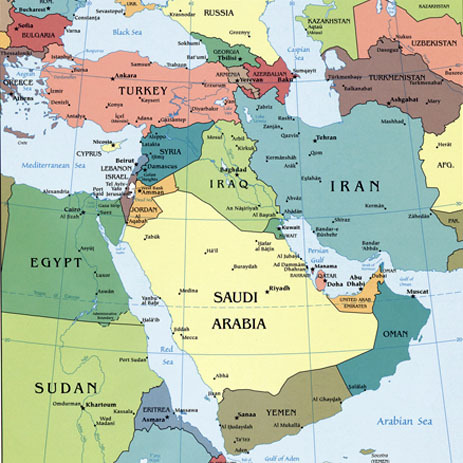 Fundamental change can only occur if these Arabic countries are treated with a different lens. Instead of ensuring what is best for foreign policy in the West, the policy should be built around the wellbeing of the region and its people. The same energy, passion and enthusiasm that have swept over the region can and should sustain it in these tough times. The Arabic people of Egypt, Syria, and Palestine will endure these tough times with a resiliency that has been bred over the past thousand years. Strong and powerful nations are not built overnight and growing pains and struggle are to be expected. While real Middle Eastern social progressive change may seem hard to measure and marginal at present, the future is still bright. The key for the rest of the world is to believe that message and allow democracy and social progress to occur, so that a truly free peaceful Middle East can become a reality.